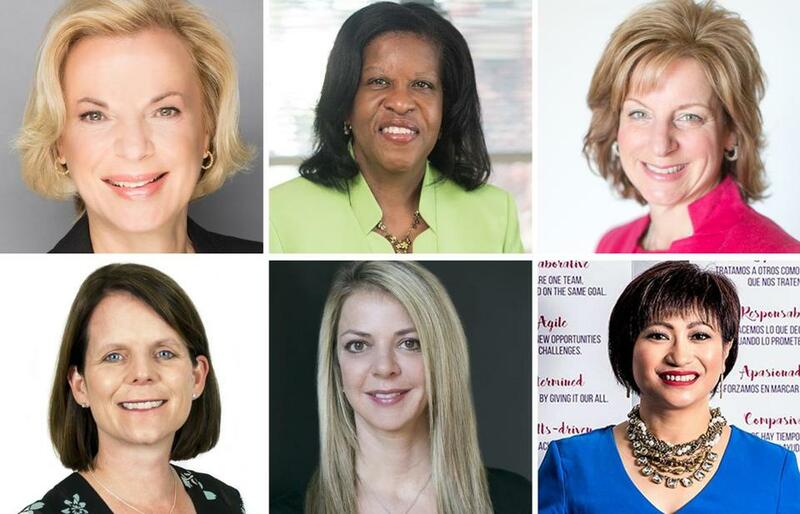 Leaders included in the Top 100 Women-Led Businesses in Massachusetts share advice they’ve gotten and given. From top left: Elizabeth G. Nabel, Sandra Cotterell, and Maryrose Sylvester. From bottom left: Maureen Franco, Jacqui Lewis, and Connie Tang. Get the best of the Magazine’s award-winning stories and features right in your Inbox every Sunday. Sign up here. Read our entire Women & Power package at bostonglobe.com/womenandpower. What words or mission statement do you live by in the workplace? I’ve found that success is achieved in large part through collaboration. By bringing together diverse voices and opinions, and fostering a culture where employees are encouraged to contribute, we’ve been able to achieve many of our strategic goals. How does having more women in positions of power benefit a company? Women create more inclusive workplaces that encourage more participation, commitment, and employee retention. They champion more innovations that benefit both women and men, including on-site day care, job sharing, flexible hours, and other family-friendly practices. My mantra is all about people — success comes down to who you work for, who you work with, and who you hire. I have never regretted spending extra time to vet a candidate, mentor a rising star, or even closely evaluate the people who were hiring me. It is crucial that those you work alongside challenge you to think more creatively and strategically. What advice has had the biggest impact on your success over the years? A number of years ago, a GE leader told me to “find the open door.” Our business was going through a very challenging time, and his point was that I needed to change my lens and start viewing the struggle as an opportunity. Sometimes that means driving a new kind of vision or a different way of working. If you start to look at every challenge as an opportunity, you’ll find new ways of solving problems. There’s always an open door; a leader’s job is to find it and guide others through it. It ensures that a company benefits from diversity of thought and perspective, which research shows results in better decision making. Women make up a large percentage of the workforce, so having women in power ensures that the leadership can best represent female employees, clients, and customers. Most women are inherently multi-taskers. They see things that need to be done and, instead of pointing fingers or [looking to receive] the credit, they find the solution and implement it. These are the people who propel the company. What myth about women in the workplace needs to be corrected? The myth lingers that taking maternity leave affects one’s performance and commitment, despite plentiful evidence to the contrary. Legally safeguarding equal parental leave and employment protections for parents of all genders would, over time, help to break down this myth. The myth that having and raising a family prevents women from obtaining top leadership roles in the workplace. You may adjust or shift your work priorities, but that does not need to keep you from top leadership positions. Your abilities to excel, multi-task, nurture, and innovate are the very qualities that top leaders possess. What one change would make the most difference for women’s workplace equality? Less talking and more doing. Move who sits in the seats. When the reserved tables at the city’s business meetings are still predominantly men, we are still just talking. I keep reading articles about the need for more women on corporate boards, and yet we have 100 women right here who qualify and I bet only 10 percent sit on corporate boards. It’s not that there are not qualified women; there are not men willing to change up the seats. What gives you the most hope for women as leaders in the workplace? Other women. The opportunity I have had to be mentored by strong women so helped me. Now I get to be a mentor to women who are developing their careers, and I find that extremely satisfying — plus, I learn from these young women and grow myself. When my husband and I moved from New York to Texas, my mother told me to take the first job I was offered, but my husband said the opposite, that I should give myself a chance to find what was right for me. I signed up with a temp agency, which gave me time to go on job interviews, and became a self-taught networker. I turned down all the offers I got in the first six months because they weren’t opportunities where I could do what I loved, which was to create, build, and grow. The job I took launched my career. Be you, be authentic, be driven by your purpose, and don’t fear what you haven’t done before. Henri A. Termeer, then the CEO of Genzyme, told me that in 2007. He was the first to highlight for me that any roadblocks in my path were put there by me, whether by limiting beliefs about my capability or by not being authentic. He pointed out that one-on-one I was authentic and clearly showed my passion, drive, and creativity, but in larger group settings I was trying too hard to meet standards I thought others expected. This was a huge “aha” moment for me. This advice has stayed with me and has served as an inner compass. Am I speaking from my authentic voice? Am I making decisions guided by personal intentions? Am I stretching and pushing myself further based on alignment with my purpose and without fear of an untested path?